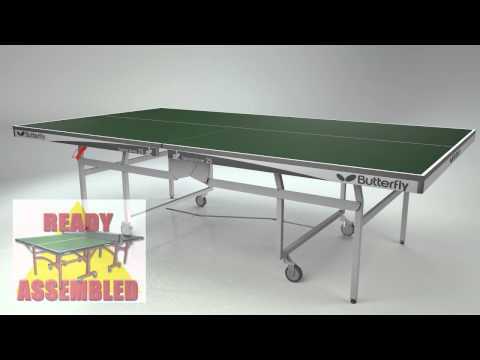 The Butterfly Space Saver system is the easiest and most convenient method for moving and storing a table. This is combined with a 25mm Perfect Grip top and is ready assembled. The Space Saver is a great choice for sports centres, schools and clubs. The most popular table used in sports centres, recreation halls or schools as a 25mm Centrefold style match standard quality table. 25mm match playing top with ‘Perfect Grip’ surface. Double security system with safety locks. Attractive green playing top with matching light silver legs and undercarriage. The “Perfect Grip” surface increases the consistency and reliability of the bounce of the ball for both topspin and backspin shots, giving the players every confidence to play their game.